Photography can take us places, we’ve never been before, perhaps never dreamed of. There are some photographs that will make you stop and think. These 10 photographs stopped the world and people hold their breaths for a few seconds to take it all in. 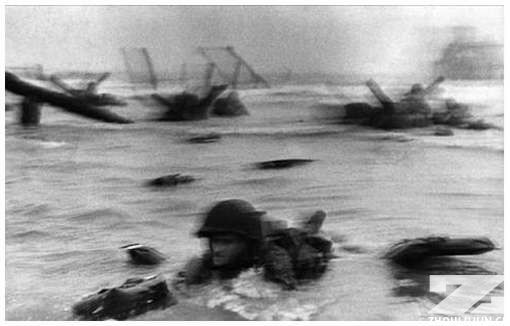 “If your pictures aren’t good enough,” war photographer Robert Capa used to say, “you aren’t close enough.” Words to die by, yes, but the man knew of what he spoke. After all, his most memorable shots were taken on the morning of D-Day, June 6, 1944, when he landed alongside the first waves of infantry at Omaha Beach. In an ironic twist, however, that same mistake gave the few surviving exposures their famously surreal look (”slightly out of focus,” Life incorrectly explained upon printing them). More than 50 years later, director Steven Spielberg would go to great lengths to reproduce the look of that “error” for his harrowing D-Day landing sequence in “Saving Private Ryan,” even stripping the coating from his camera lenses to echo Capa’s notorious shots. As era-defining photographs go, “Migrant Mother” pretty much takes the cake. 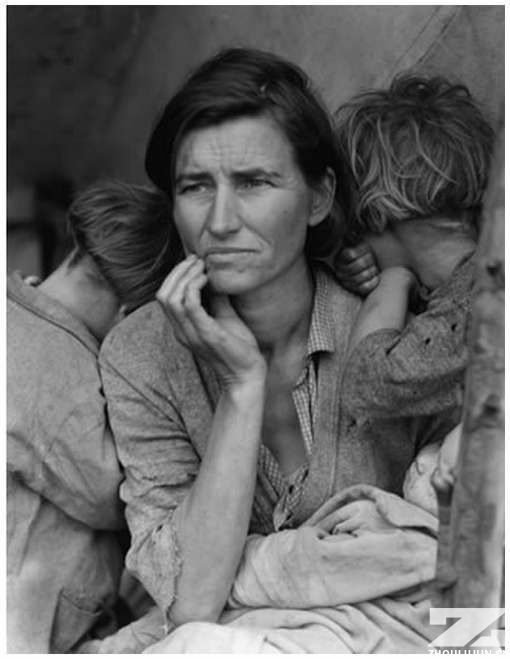 For many, Florence Owens Thompson is the face of the Great Depression, thanks to legendary educated and apprenticed photojournalist Dorothea Lange. Lange captured the image while visiting a dusty California pea-pickers’ camp in February 1936, and in doing so, captured the resilience of a proud nation facing desperate times. Unbelievably, Thompson’s story is as compelling as her portrait. Just 32 years old when Lange approached her (”as if drawn by a magnet,” Lange said). Thompson was a mother of seven who’d lost her husband to tuberculosis. Stranded at a migratory labor farm in Nipomo, Calif. her family sustained themselves on birds killed by her kids and vegetables taken from a nearby field – as meager a living as any earned by the other 2,500 workers there. The photo’s impact was staggering. Reproduced in newspapers everywhere, Thompson’s haunted face triggered an immediate public outcry, quickly prompting politicos from the federal Resettlement Administration to send food and supplies. Sadly, however, Thompson and her family had already moved on, receiving nary a wedge of government cheese for their high-profile misery. In fact, no one knew the identity of the photographed woman until Thompson revealed herself years later in a 1976 newspaper article. As one of the world’s first war photographers, Mathew Brady didn’t start out having as action-packed a career as you might think. A successful daguerreotypist and a distinguished gentleman, Brady was known for his portraits of notable people such as Abraham Lincoln and Robert E. Lee. In other words, he was hardly a photojournalist in the trenches. In fact, Brady had everything to lose by making a career move – his money, his business, and quite possibly his life. Nevertheless, he decided to risk it all and follow the Union Army into battle with his camera, saying, “A spirit in my feet said, ‘Go!’” And go he did – at least until he got a good look at the pointy end of a Confederate bayonet. Tethered as he was to his equine-powered darkroom and with film speeds being much slower then, Brady produced war photos that are understandably light on the action and heavy on the aftermath. 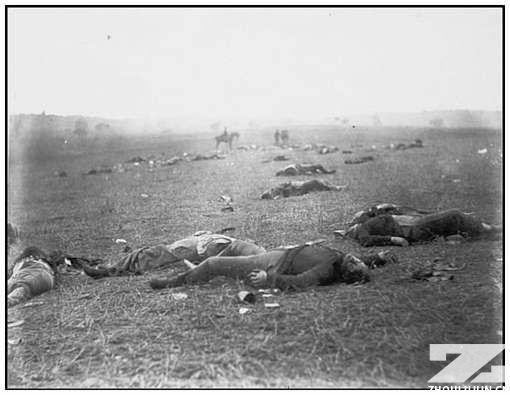 Still, they mark the first time Americans were so immediately confronted with the grim realities of the battlefield. “Still photographs are the most powerful weapon in the world,” AP photojournalist Eddie Adams once wrote. A fitting quote for Adams, because his 1968 photograph of an officer shooting a handcuffed prisoner in the head at point-blank range not only earned him a Pulitzer Prize in 1969, but also went a long way toward souring Americans’ attitudes about the Vietnam War. For all the image’s political impact, though, the situation wasn’t as black-and-white as it’s rendered. 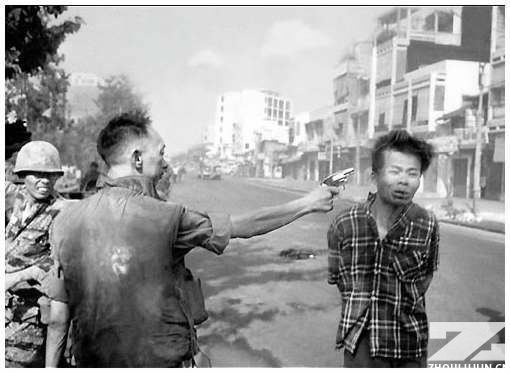 What Adams’ photograph doesn’t reveal is that the man being shot was the captain of a Vietcong “revenge squad” that had executed dozens of unarmed civilians earlier the same day. Regardless, it instantly became an icon of the war’s savagery and made the official pulling the trigger – General Nguyen Ngoc Loan – its iconic villain. Sadly, the photograph’s legacy would haunt Loan for the rest of his life. Following the war, he was reviled where ever he went. After an Australian VA hospital refused to treat him, he was transferred to the United States, where he was met with a massive (though unsuccessful) campaign to deport him. He eventually settled in Virginia and opened a restaurant but was forced to close it down as soon as his past caught up with him. Vandals scrawled “we know who you are” on his walls, and business dried up. On August 14, 1945, the news of Japan’s surrender was announced in the United States, signaling the end of World War II. Riotous celebrations erupted in the streets, but perhaps none were more relieved than those in uniform. Although many of them had recently returned from victory in Europe, they faced the prospect of having to ship out yet again, this time to the bloody Pacific. Of course, a photo of the sailor planting a wet one on a senior citizen wouldn’t have made the cover of Life, but when he locked lips with an attractive nurse, the image was circulated in newspapers across the country. 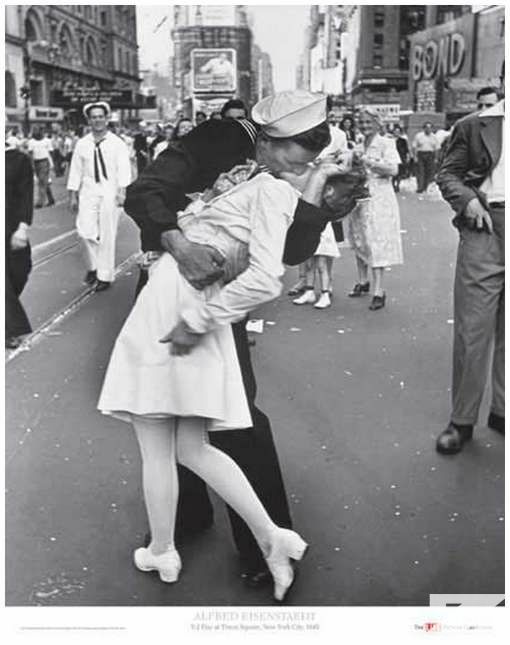 Needless to say, “V-J Day” didn’t capture a highly anticipated embrace by long-lost lovers, but it also wasn’t staged, as many critics have claimed. In any case, the image remains an enduring symbol of America’s exuberance at the end of a long struggle. Forget the Titanic, the Lusitania, and the comparatively unphotogenic accident at Chernobyl. Thanks to the power of images, the explosion of the Hindenburg on May 6, 1937, claims the dubious honor of being the quintessential disaster of the 20th century. In the grand scheme of things, however, the Hindenburg wasn’t all that disastrous. Of the 97 people aboard, a surprising 62 survived. (in fact, it wasn’t even the worst Zeppelin crash of the 20th century. Just four years earlier, the U.S.S. Akron had crashed into the Atlantic killing more than twice as many people.) But when calculating the epic status of a catastrophe, terrifying photographs and quotable quotes (”Oh, the humanity!”) far outweigh body counts. Assembled as part of a massive PR campaign by the Hindenburg’s parent company in Germany, no fewer than 22 photographers, reporters, and newsreel cameramen were on the scene in Lakehurst, N.J. when the airship went down. 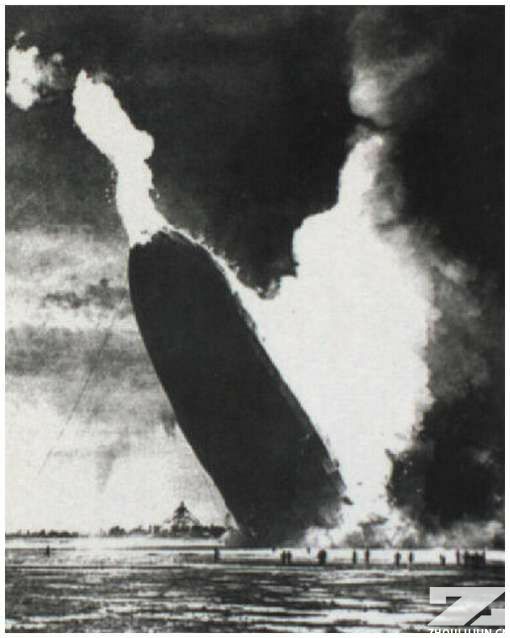 Worldwide publicity of the well-documented disaster shattered the public’s faith in Zeppelins, which were, at the time, considered the safest mode of air travel available. During the 1920s and 1930s, Zeppelins had operated regular flights, totting civilians back and forth between Germany and the Americas. But all of that stopped in 1937. The incident effectively killed the use of dirigibles as a commercially viable mode of passenger transport, ending the golden age of the airship not with a whimper, but with a horrific bang that was photographed and then syndicated around the globe. Some claim photography can be divided into two eras: Before Adams and After Adams. In Times B.A., for instance, photography wasn’t widely considered an art form. Rather, photographers attempted to make their pictures more “artistic” (i.e., more like paintings) by subjecting their exposures to all sorts of extreme manipulations, from coating their lenses with petroleum jelly to scratching the surfaces of their negatives with needles. 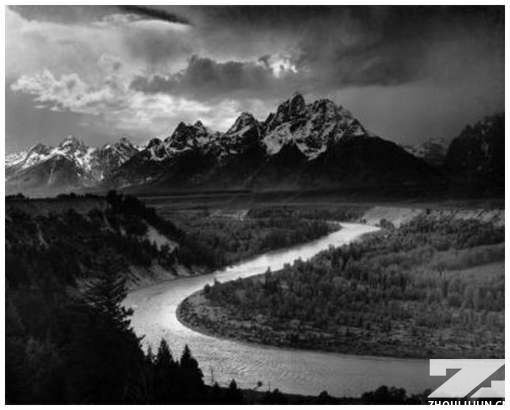 Then came Ansel Adams, helping shutterbugs everywhere get over their collective inferiority complex. Brashly declaring photography to be “a blazing poetry of the real,” Adams eschewed manipulations, claiming they were simply derivative of other art forms. Instead, he preached the value of “pure photography.” In an era when handheld point-and-shoot cameras were quickly becoming the norm, Adams and other landscape photographers clung to their bulky, old-fashioned large-format cameras. Ultimately, Adams’ pictures turned photography into fine art. What’s more, they shaped the way Americans thought of their nation’s wilderness and, with that, how to preserve it. Adams’ passion for the land wasn’t limited to vistas he framed through the lens. In 1936, he accompanied his photos to Washington to lobby for the preservation of the Kings Canyon area in California. Sure enough, he was successful, and it was declared a national park. Sociopathic thug? Socialist luminary? Or as existentialist Jean-Paul Sartre called him, “the most complete human being of our age”? Whatever you believe, there’s no denying that Ernesto “Che” Guevara has become the patron saint of revolutionaries. Undeniably, he is a man of mythical status – a reputation that persists less because of how he lived than because of how he died. 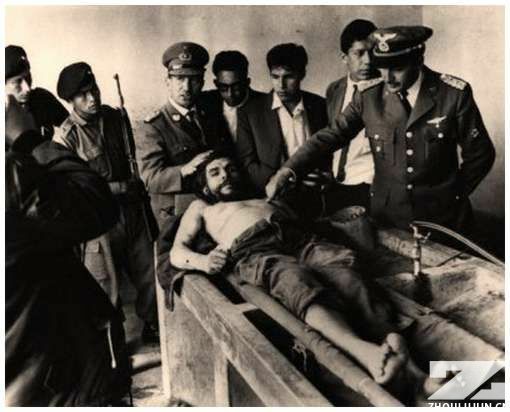 Unenthused by his efforts to incite revolution among the poor and oppressed in Bolivia, the nation’s army (trained and equipped by the U.S. military and the CIA) captured and executed Guevara in 1967. But before dumping his body in a secret grave, they gathered around for a strategic photo op. They wanted to prove to the world that Che was dead, in hopes that his political movement would die with him. in fact, anticipating charges that the photo had been faked, Che’s thoughtful captors amputated his hands and preserved them in formaldehyde. But by killing the man, Bolivian officials unwittingly birthed his legend. The photo, which circulated around the world, bore a striking resemblance to Renaissance paintings of Christ taken down from the cross. Even as Che’s killers preened and gloated above him (the officer on the right seems to be inadvertently pointing to a wound on Guevara’s body near where Christ’s final wound was inflicted), Che’s eerily peaceful face was described as showing forgiveness. The photo’s allegorical significance certainly wasn’t lost on the revolutionary protesters of the era. They quickly adopted “Che lives!” as a slogan and rallying cry. Thanks to this photograph, “the passion of the Che” ensured that he would live on forever as a martyr for the socialist cause. So why the history-making tongue? It seems Professor Einstein, hoping to enjoy his 72nd birthday in peace, was stuck on the Princeton campus enduring incessant hounding by the press. Upon being prodded to smile for the camera for what seemed like the millionth time, he gave photographer Arthur Sasse a good look at his uvula instead. 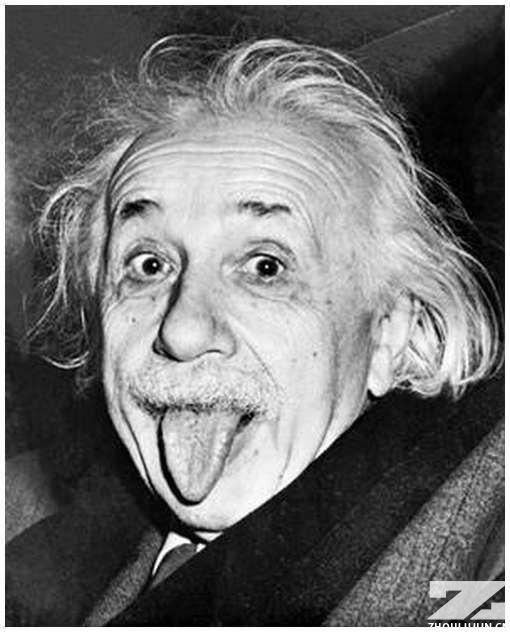 This being no ordinary tongue, the resulting photo became an instant classic, thus ensuring that the distinguished Nobel Prize-winner would be remembered as much for his personality as for his brain. Philippe Halsman is quite possibly the only photographer to have made a career out of taking portraits of people jumping. But he claimed the act of leaping revealed his subjects’ true selves, and looking at his most famous jump, “Dalí Atomicus,” it’s pretty hard to disagree. 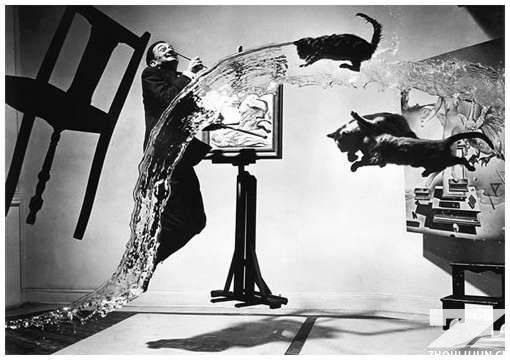 The photograph is Halsman’s homage both to the new atomic age (prompted by physicist’ then-recent announcement that all matter hangs in a constant state of suspension) and to Dalí’s surrealist masterpiece “Leda Atomica” (seen on the right, behind the cats, and unfinished at the time). It took six hours, 28 jumps, and a roomful of assistants throwing angry cats and buckets of water into the air to get the perfect exposure. But before settling on the “Atomicus” we know today, Halsman rejected a number of other concepts for the shot. One was the idea of throwing milk instead of water, but that was abandoned for fear that viewers, fresh from the privations of World War II, would condemn it as a waste of milk. Another involved exploding a cat in order to capture it “in suspension,” though that arguably would have been a waste of cats. Halsman’s methods were as unique as they were effective. His celebrity “jump” portraits appeared on at least seven Life magazine covers and helped usher in a new – and radically more adventurous – era of portrait photography.